Spider veins, or telangiectasias, are those tiny purple and red blood vessels found most commonly on the thighs or lower legs of women. They are hereditary and can form anywhere on the leg, from the top of the thigh to the ankle. Occasionally, spider veins appear on the face. Varicose veins are larger. They can appear raised with a bluish color and can become quite painful. Although spider veins and varicose veins carry blood, they are not part of the venous valve system. A simple office procedure called Sclerotherapy is performed by our doctor for patients in our region to permanently eliminate or minimize your spider veins and varicose veins. The Sclerotherapy treatment was developed in the 1920's. During the procedure, a sclerosing solution is injected into the vein through a micro-needle. The tiny needle generally causes very little pain. The sclerosing solution causes the vein to blanch (turn white), then gradually disappear. A typical treatment may last for 15 - 20 minutes and consist of multiple injections. 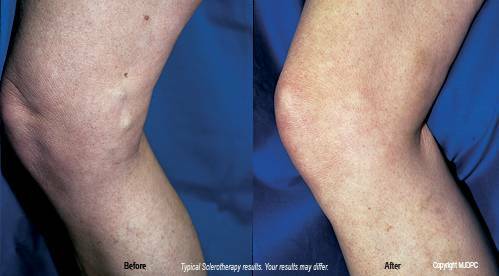 Injection Sclerotherapy may eliminate the need for an invasive surgical procedure. Will Sclerotherapy work on my veins? Prior to treatment, our physician will review your complete medical history to determine how long you have had a problem with your veins and the severity of the problem. We need to know if the problem is exacerbated by physical activity and if there has been any prior surgery or treatment on your veins. The doctor may test to determine if the venous system is affected. If it is, surgery may be advised before Sclerotherapy is attempted. If the area to be treated can be saved, Sclerotherapy will be recommended. What are Sclerotherapy treatments like? First, we thoroughly cleanse the area to be treated with alcohol. Then we mark the veins to be treated while you are standing. The larger veins are usually treated first. Using a tiny syringe fitted with a micro-needle, your physician will inject a small amount of sclerosing agent into the vein. Sclerosing solution displaces the blood within the vein. It then causes irritation to the lining of the vein, making it swell shut. The needle is withdrawn and pressure to the area is applied immediately. While each vein may require several injections, most disappear in 2 weeks to 2 months. Most Sclerotherapy patients report little if any discomfort. A few may experience a mild burning sensation when we inject the solution, but it stops in a few seconds. Are there other vein treatments besides Sclerotherapy available? Today's new medical lasers provide a safe and effective non-surgical treatment option for the removal of some spider veins. 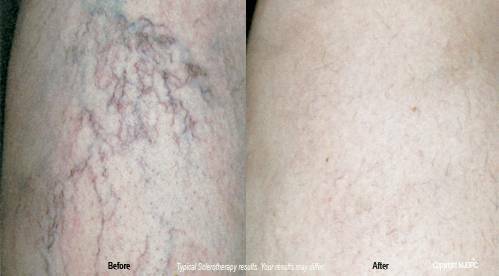 Advanced laser treatments deliver a precise dosage of energy to each vein. During your treatment, light energy is delivered through a special laser handpiece to the targeted vein, in a series of brief pulses. The light energy is absorbed by the blood vessels, but not the surrounding tissue. This heat absorption causes a coagulation of the blood vessel, which is subsequently absorbed by your body. Usually more than one treatment is required. In most cases, about 50 - 70% of the treated vessels will be gone for good. However, new veins may appear and additional treatments are generally required for optimum results. These treatments may be in 3 week intervals. What is recovery from Sclerotherapy like? After Dr. Lowell Hughes performs Sclerotherapy, you may be asked to wear special heavy-duty stockings to help keep pressure on the veins. This will reduce bruising and help keep the treated veins closed. Bruises around the treated areas usually disappear after the first week. A tan or brownish pigment may persist for 6 - 8 weeks when larger veins are involved. Occasionally, small clots can develop at the injection site. These are not a cause for concern and may be removed to allow healing to progress. Patients are generally encouraged to resume normal activities immediately. We do ask that you refrain from vigorous activities for the first 24 hours. Walking is encouraged because it increases blood flow through the other veins. Although your final results may not be apparent for several months, most patients experience a 60% - 80% improvement.